Like the legendary Volkswagen Beetle, that other enigma of 20th Century motoring, Citroën's 2CV, was actually conceived before the last war, and in fact 250 were built in readiness for the 1939 Paris show which, of course, was never held. This strange device eventually saw the light of day at the same show in 1948, since when well over 21 million have been made, and found their way to every corner of the world. Last year the French baby celebrated its 25th birthday and Citroën reminded the world of the car's incredible stamina by sending no fewer than 60 to traverse the jungles and deserts of Africa. Perhaps the most remarkable facet of the 2CV's history is the infinitesimal change that has taken place in a production span only matched by that of the Beetle itself. If ever there were proof of the original concept's soundness, then this is it. Today's 2CV is so like the original that you automatically glance again at the "N" registration to make sure you are not dreaming, and it takes an expert to note that the front doors no longer open backwards but forwards, that an extra window has been squeezed in to the rear quarters, that the headlamps are now rectangular rather than round and that the back window has grown with the car's years. Of course there are other subtle changes to the styling, and modern laws and safety regs have caused the car to arrive more comprehensively equipped, but basically it's the same old "two horses." The twin cylinder engine of the original version had a capacity of 375cc, and today's Citroën baby comes with either a 435 or 602 cc unit. Although they are probably unaware of the reason, many will remember that we had these cars on our roads once before; then they disappeared. In fact due to the prohibition of any vehicles with inboard front brakes the 2CV was not imported to the UK until 1953. Once the law was amended, an assembly plant was created at the Citroën factory in Slough and the cars sold in some numbers until 1959. They were turned out as soft-top saloons, vans and even pick-ups, many of which were specially adapted for use on aircraft carriers. Imports however were finally ceased in 1961 when it was no longer considered viable to assemble cars in such a relatively small quantity. 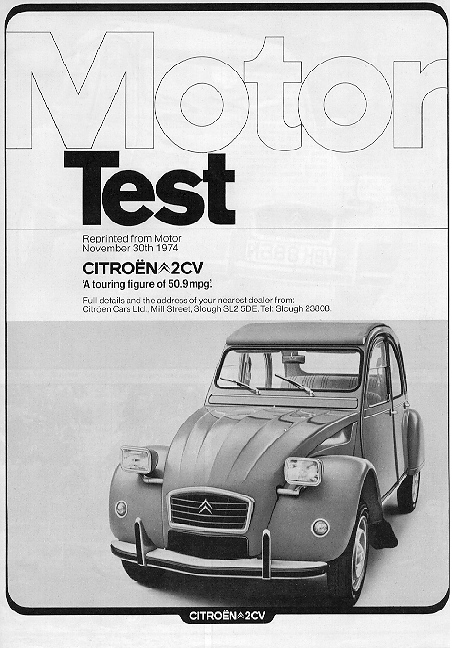 This still stands, but being fully aware of the present economic climate, Citroën feel the benefit of their age-old "economy special" should once again be felt by the British. In consequence, they are now producing, in France, a special right-hand drive version especially for the UK market. Though the price has sadly already been revised since the car's reintroduction at this year's motor show, at £898.56 it is still one of the cheapest models on the British market. We thoroughly enjoyed our reacquaintance with this character car, and expect it to be a great success in this country once again. The 2CV started life with a horizontally-opposed, air-cooled overhead valve twin-cylinder engine of a mere 375 cc. This ran on a 6.2:1 compression ratio and produced 9 bhp. Since then the engine, if not the car, has grown in stature and the French now hav e a choice of the 2CV4, 435 cc or the 2CV6, 602 cc. Only the latter is to be imported to Britain. This oversquare unit produces 28.5 bhp at 6750 rpm and 28.9 lb ft of torque at 3500 rpm. 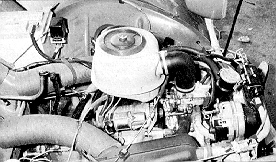 It is virtually identical to the engine in the Dyane we tested five years ago (Motor, July 19, 1969) and indeed returned a similar performance. At 67.1 mph the top speed was within 1 1/2 mph, the Dyane just having the edge. The Dyane was marginally quicker on standing-start acceleration, too, needing only 30.8 seconds to attain 60 mph as opposed to the 2CV's 32.8 secs. Through this is hardly scintillating performance , it's quite commendable for 602 cc and good enough to show an exhaust pipe to Fiat's 594 cc baby 126 and even Renault's 845 cc R4. In top gear flexibility our 2CV proved a winner, knocking spots off the Fiat 126 and even beating its stablemate the Dyane by 0.8 secs for the 3050 mph increment. Certainly there is no lack of torque low down, despite the peak being as high in the range as it is. What can catch you unawares is the heavy flywheel effect, which makes the engine slow to respond at first but you soon learn to summon a few revs before, rather than while. starting to raise the clutch foot. Once in its stride, though the little flat-twin will happily rev to, and even well beyond, the recommended changeup points on the speedometer. In fact our mean maximum speed only represents just over 5400 rpm and apart from registering a best flying 1 mile on the flat of 70.9 mph we frequentl y saw a genuine 80 mph on slight downhill inclines. It is an engine that really seems to thrive on work and never protests at being driven hard. Though it needed some choke to start from cold, our car wouldn't run on it for more than a few seconds and once the engine had fired the knob could be pushed home immediately. The engine warmed quickly and never missed a beat from then on, ticking over with machine-like smoothness and remarkably little noise and retaining these characteristics at high revs. 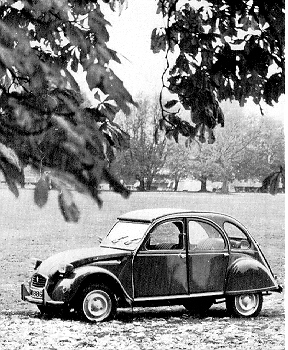 Citroën have been known to refer to the 2CV as "the most economical car in the world." This may or may not be true. Certainly, by our figures, it ranks as one of the most thrifty and has tremendous potential for someone with a suitably light throttle foot. In our hands, where we freely admit it was subjected to a very considerable amount of flat-out driving, it still gave an overall consumption of 36 mpg, identical in fact to the figure obtained from the similarly-engined Dyane. However, in this case, more than most, it is the touring figure that suggests what remarkably frugal returns could be achieved. This computed figure of 50.9 mpg is based on a touring speed of 48.5 mph and includes an allowance for acceleration. The 2CV has a 4.5 gallon tank, so despite the high measure of economy has a maximum range between fill-ups of no more than 229 miles. As with the Dyane we found the car ran happily on three-star fuel - another saving. Even if you're not old enough to have driven one of the earlier "British" 2CVs, the influx of "umbrella" change Renaults to this country may well have put you in tune with the 2CV's "in dash" gearchange. The awkwardness of its unorthodox change pattern, with first to the left and back is the major criticism we have of an otherw ise very workable system. Porsche abandoned this configuration for this very reason, and on the RHD 2CV matters are worsened by the left-hand having to turn the lever through apparently nasty angles that would of course pose no problem to somebody sitting in the other seat. First gear synchromesh was also rather weak, so a downward change or, sometimes, engagement at rest was accompanied by a slight grating. The synchro on the other gears was virtually unbeatable. The ratios are inevitably something of a compromise an a car with such a small engine and though open to criticism, those of the 2CV are quite sensible. There is a noticeable "hole" between first and second gear, but when you appreciate that first will only just cope with a restart on a 1 in 3 incline and that in no way is second too high, it is hard to see how a better compromise could be achieved. Third gear is good for virtually 60 mph, adequate for many overtaking manoeuvres, and top sufficiently long -legged to withstand flat-out motoring indefinitely. The reasonably light clutch brought little or no comment from our testers. It was smooth in its action and free from judder or slip. However, one soon learns to treat it with respect as a heavy footed gearchange brings out the worst in the unique suspensi on system and the car tends to lurch forward like an angry donkey. its faults but it does work. Despite the very high caster angle, in this case 15 deg, the steering of the 2CV is tolerably light and very precise. Many sports cars manufacturers could learn from the gearing too, which requires a mere 2.5 turns to swing the car from lock to lock. Centering from a 50 ft circle took only 0.9 of a turn � most cars need much more. The 2CV wouldn't be a Citroën if it didn't have some quirk to its suspension, and of course it has. Unchanged since the car's introduction, the interconnected springing of the 2CV remains one of its most unusual features. Briefly, the leading front arm and trailing rear arm on each side are connected by tension rods to a pair of centrally-mounted coil springs with the object of reducing pitch oscillations. Damping at the front is by friction units, at the rear by hydraulic ones. There is very little roll stiffness and relatively high angles of roll are adopted almost as soon as you turn the wheel on the entry to a corner. Conventional terms like understeer and oversteer have no place in the 2CV man's vocabulary and to say the car either goes round the corner or it doesn't would probably be more applicable in this case. The grip afforded by the Michelin Xs on both wet and dry roads was extraordinarily good in view of the high roll angles, though naturally the car doesn't corner as well as rivals like the Mini or Fiat 127. When there is a loss in adhesion, it's the front that gives way, whereupon lifting off will restore the status quo. The only other phenomenon we noticed was the tendency for midcorner bumps to throw the car momentarily off line, suggesting a degree of bump steer in the trailing arms. It says little for our legislators that one of the good points of the 2CV's design, its inboard front brakes, were the very reason for it not being imported to the UK prior to 1953. Quite apart from the desirable saving in unsprung weight that such a system offers, this particular set-up on the 2CV is very effective. The pedal has outstanding feel and we comfortably recorded in excess of 1g during our emergency stop test. However, the all-drum system did partially succumb to our 20-stop fade test, the required pedal pressure rising by five pounds. The water splash had no effect whatsoever. At 0.74g, the deceleration obtained with the handbrake from 30 mph is, as far as we can remember, the best we have ever achieved. And the system also held the car securely on the l-in-3 slope. 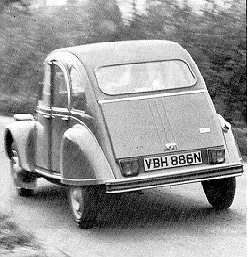 Of course on the 2CV the handbrake operates on the front wheel s, a desirable arrangement that more manufacturers would do well to follow. Despite the absence of door pockets or console trays, there is a fair amount of oddment space in the 2CV. There is a generous parcel shelf on the passenger side which is continued briefly to the right of the instrument binnacle. More bulky objects can be stowed underneath the front or rear seats. 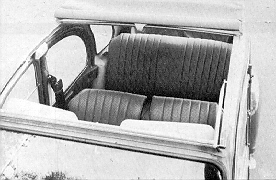 Whereas many of the 2CV's competitors will be two-door models, Citroën passengers, of course, each have their own door. 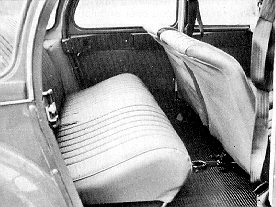 Entry to the rear is certainly no problem and once there, the boxy design ensures adequate head and legroom for all but the tallest of people, this despite the fact that they sit noticeably higher than the front passengers due to the location of the fuel tank underneath the rear seat cushion. We squeezed 7.6 cu ft of luggage into the cavernous boot. You become aware of the 2CV's unique brand of suspension from the time you step through the door and the car leans and bounces in tune with your body movements. Yet once you are on the move, the peculiarities are more apparent to onlookers than passengers, particularly the tendency to bounce - a phenomenon that only becomes objectionable over the worst of undulations. Bumps and potholes as opposed to undulations don't seem to bother the 2CV at all, and it will bound happily over broken or unmade roads at 10 or even 15 mph faster than you would dare drive many a conventional car. 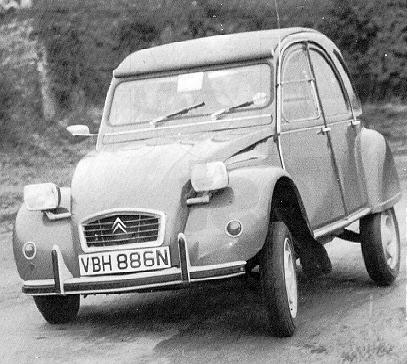 Though the famous 2CV hammocks have long since been replaced by conventionally sprung seats, the flight deck of the baby Citroën is still unusual. 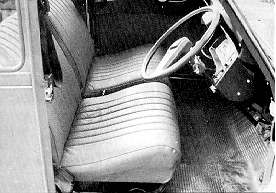 The narrowness of the cockpit means that the pimply Ambla trimmed couches virtually meet in the middle, leaving room only for the steel hoop of the static seat belts. The driver sits quite upright, with his hands falling naturally towards the top of the large flattish steering wheel, and his shoulders accurately positioned by the door pillar on one side and his companion on the other. If anything, there is an excess of thigh support and the right leg can suffer after a few miles of forcing the organstyle accelerator pedal into the rubber matted floor. Lateral support is adequate and there is sufficient adjustment to satisfy most drivers. The pedal layout is sensible, and the brake and throttle are ideally positioned for heel and toe changes. Citroën's traditional single spoke steering wheel affords a good view of the functional instrument cluster and its accompanying switchgear. To the right of the speedometer is a tiny oil pressure warning light, the push/push switches for hazard warning lig hts and single-speed wipers and a sensibly placed button for the effective manual washer system. Also, traditionally Citroën is the column mounted light stalk, the head of which revolves to operate everything from side lights to main beam headlights. Finally on the left of the column is the indicator stalk which has an extremely penetrating, metronome-like click to remind you to cancel your signal. The remaining controls are rather scattered. The choke, for instance, is hidden away under the facia and the three controls for the heating and ventilating system are strewn haphazardly around the cockpit. The umbrella-style handbrake is also a stretch for the belted-in driver. The combined ignition switch and steering lock posed problems for several of our drivers until they realised that you had to literally click the steering wheel into the locked position before the key could be reinserted in its hole. Once you are aware of this idiosyncrasy there is no problem. Nouveau 2CV drivers also have to acclimatise to the unique window mechanisms. They really are remarkably practical and of course overcome the need for the orthodox, space consuming winding apparatus. Basically the foremost side windows are split in two, horizontally, the lower halves of which are retained, when closed, by a simple spring catch. If opened at speed they are automatically flung up by the air-stream and proceed to hover at an angle of around 30 deg to the door. However they can be fixed open by folding flat against the upper pane and engaging the simple retaining lug in its matching socket mounted at the top of the door -� a crude but undeniably effective system. We found the sensible Toric belts easy to put on, but stiff to adjust. Also, the door pillars are a shade too far forward to make ideal mounting points. or included in the row to the right of the speedometer. One of many advantages to 2CV motoring is the view afforded by the high mounted seats, for suddenly you are looking down on scenery that would normally be at eye-level, and people in other cars appear to be slouching. Despite this, accurate positioning of the car's long lean frame is not that easy. For a start, the high waistline and shallow screen make at awkward to peer towards the front corners, which curve sharply out of sight anyway, the dumpy bolt-on wings being way below the normal sight-line. The high-set rear window and steeply raked boot also preclude a view of the tail, though this poses few problems. Lateral vision is quite adequate despite the chunky pillars either side of the rear-most side windows. The single-speed wipers leave quite a large unswept area in the righthand-corner of the windscreen, a hazard that is really only apparent when negotiating sharp right-handers, when the high degree of body roll finds you struggling to see through that particular patch of screen. The headlights are excellent and would put those of many a £2000 car to shame. Also, their throw is instantly adjustable by way of a large knurled knob under the facia. This tilts their mounting bar about its own axis. A straight-forward, moulded plastic binnacle contains all the information one really needs for a 2CV, though in common with nearly all other French creations the car lacks a temperature gauge. A large speedometer is calibrated in 10 mph intervals up to 80 mph - a figure it will happily register on a slight incline. Below are a matching battery condition meter and fuel gauge. Unlike the speedometer, the fuel gauge on our test car was grossly inaccurate and never recorded much more than three-quarters of a tank even when the petrol was brimming over. In the center of the cluster, under the optimistic odometer, lies the gear pattern -� a reminder that first is not where you would like it to be, but to the left and down. French students will recognise the AR symbol as short for arriere, meaning backwards. As is usual with air-cooled engined cars, heated air is passed through an exhaust heat-exchanger by the engine cooling fan. It can take some time for the heated air to permeate the interior if you run from cold straight into dense, slow moving traffic. The problem is confounded by the rather ill-fitting doors which are all too ready to allow cold air in. However, once a reasonable pace has been attained seems quite capable of combating the draughts and keeping even the rear seat passengers comfortable. The controls, though scattered, couldn't be simpler. A slide lever under the lip of the facia controls the flow of incoming air and a push/pull one under the parcel shelf distributes it to the screen or floor as desired. Our method of grading allows the 2CV's ventilation system only one star, though to be fair the Citroën's simple flap system does work remarkably well. 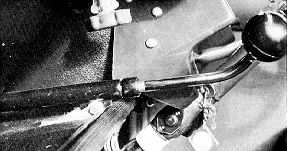 Another knurled knob, like that used to adjust the headlights, raises and lowers the scuttle-mounted flap as desired. Though hardly as efficient or adaptable as an eye-ball vent it is a welcome alternative on a car where everything is designed to keep production costs down. All 2CVs come with a plastic grille muff, which the handbook recommends should be installed as soon as temperatures drop below the 50 deg mark. It should be removed again in a climate of 59 deg or above. is controlled from the inside by a knurled knob. Mounted right in the nose of the engine compartment and under a felt covered bonnet, the little flat-twin sings away happily to itself without ever really becoming obtrusive. Even at peak revs it remains smooth and unflustered and totally free of vibration. Not so the gearbox, however, which makes more than its fair share of rattles and whines. It literally groans in first gear and whines in the other ratios all of which are indirect. Wind noise is remarkably subdued up to around the 65 mph mark whereupon the tops of the doors start to move out and the decibels rise markedly. Road roar is well suppressed and even dramatic changes in surface make little difference to the sound from below. Some bumps however, do crash through. It's hard to determine what should be included as standard on a car of under £900. Few people would live without a heater and such items as seat belts and windscreen washers are now compulsory, so they don't come under that heading. Either way we doubt if any prospective 2CV owner will be disappointed with what he finds. To start with there is that magnificent roll back roof, the envy of all other drivers. Then there are the adjustable head lamps, the door mirror, the passenger sun-visor and vanity mirror, hazard warning lights, front overriders and rubber inserts for the bumpers, not to mention the facility of being able to remove the rear seat at the flick of a lever should you need more carrying space. in the £899 price tag. famous hammock seats have long been replaced by a more conventional variety. only one catch retains the seat to the floor. 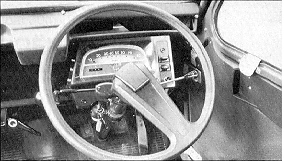 As its name implies, the 2CV was designed to work for its living, and the interior decor has been chosen accordingly. No money has been wasted in pretty trimming, but nor is the car excessively utilitarian. Sensible plastic mouldings cover the top of the facia and doors. In the case of the latter, they include a built-in hand hold for closing the door with. The lower sections of the doors are covered in leather-cloth similar in colour to the pimply variety found on the seating. The corners of the roof and rear wheel-arches are trimmed with simple felt and the floor with rubber mat. Items such as the exposed pressed steel door hinges and the catches that jut threateningly into the door opening, spell cheapness or practicality, depending on which way you care to look at it. What did impress was the total absence of corrosion, and nowhere on the exterior could we find an unplated bolt or washer. Even the paint finish was well up to par. As the mechanics of the current 2CV are all common to the better known (in the UK) Dyane, Citroën franchises are well versed in their service and repair. The free service occurs at 600 miles and can be carried out by any authorised dealer you choose. From then on the car will require lubrication at 3000 mile intervals and a full service after every 6000. The bonnet release is sited under the front bumper and apart from being stiff to open, the clasp needs physically aiming at the inside of the bonnet lid before it is lowered again, otherwise it simply fouls the underside of the lid and a stalemate develops. The spare wheel, jack and, a rare bird these days, a starting handle, and even a wooden wheel chock are all housed in the relatively cavernous boot. Most underbonnet items are readily accessible, including the washer bottle, hydraulic fluid reservoir, battery, dipstick, and carburettor. As always, the exterior panels are bolted rather than welded together, making for swift, cheap, accident repair.